At just 2.5 ounces (70 grams) the Mirage Swift Nasal Pillows is ultra light, ultra flexible, ultra adaptable and ultra secure! The Swift's nasal pillows sit flexibly and comfortably at the entrance to the nostrils to minimize facial contact and irritation; and since we include all 3 sizes of nasal pillows with every mask you're sure to get the best fit for you. Its uniquely adaptable design means that tubing can be channelled up over the head or down under the chin, and it can be attached on the left or right side of the mask so whether you sleep on your left or your right, you'll still be able to creat a comfortable tubing path. The Mirage Swift is designed to be unobtrusive and comfortable, but it's from ResMed so it also had to be ultra secure to prevent leaks and discomfort. The Swift's soft and secure headgear design enhances seal and stability, without the need for over-tightening or pinching. 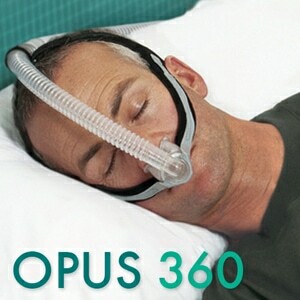 And the rotating pillow sleeve enables adjustment of the nasal pillows to create an optimal seal between the mask and the nose. 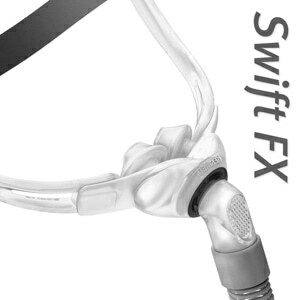 Overall the Mirage Swift is a great solution for people who can't tolerate traditional heavy masks or lots of facial contact. Ultra Light - At just 2.5 ounces the Swift is so light you'll barely know it's there. Soft and Secure Headgear - Adjustable headgear is soft so it won't pinch or need to be overtightened to create a great seal.